At E3 2018, From Software announced their latest punishing action game, Sekiro: Shadows Die Twice, but, unfortunately, didn’t release any actual gameplay footage. Sure, the game’s debut trailer was great, but Dark Souls fans need to know how Sekiro is going to make them suffer. Well, a number of outlets recently got to go hands-on with an early version of Sekiro: Shadows Die Twice, and some of the footage has made its way online today. Check out 12-minutes of narrated footage, courtesy of Kotaku, below. As you can see, Sekiro’s titular character is much more agile than Dark Souls’ lumbering protagonists. He effortlessly leaps and grapples around the environment, and can pounce on enemies with bloody Batman-like takedown moves. 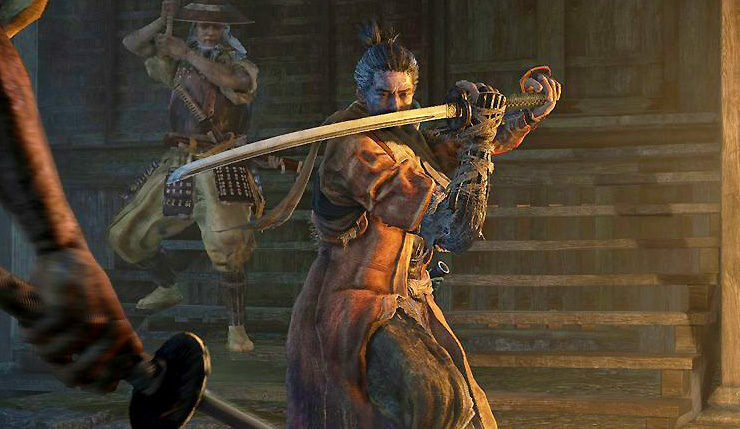 Sekiro also wields the Shinobi Prosthetic, a steampunk-style metal arm that can transform into useful and deadly tools, like a shield-splitting axe and torch. Combat also looks refreshingly speedy and dynamic. Players are free to dart in and out with quick attacks and killing blows, but will have to pay attention to their posture and strategy when facing more challenging enemies. The demo culminates in a throwdown against a dropkicking, body-slamming giant, who looks like a hearty challenge (to say the least). Sekiro: Shadows Die Twice leaps onto PC, Xbox One, and PS4 on March 22, 2019.